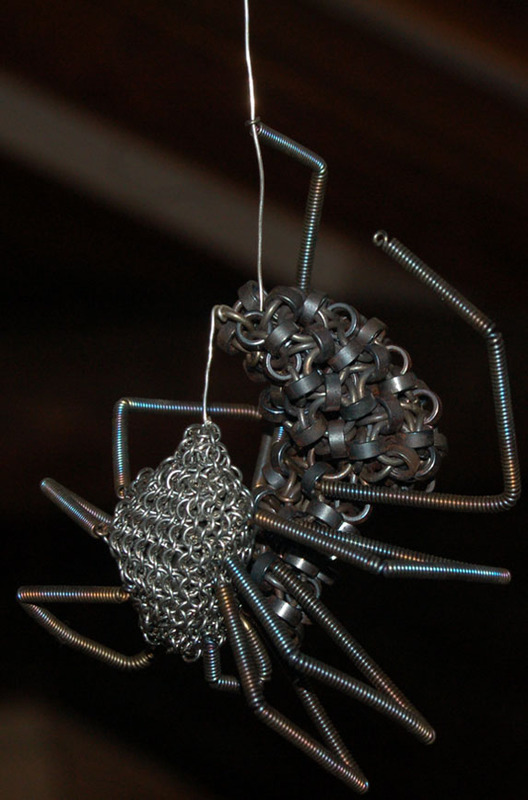 This is the third maille spider I have made. It is made partly from scraps and experimental shapes left over from making Spider #2, so materials and such are very similar. 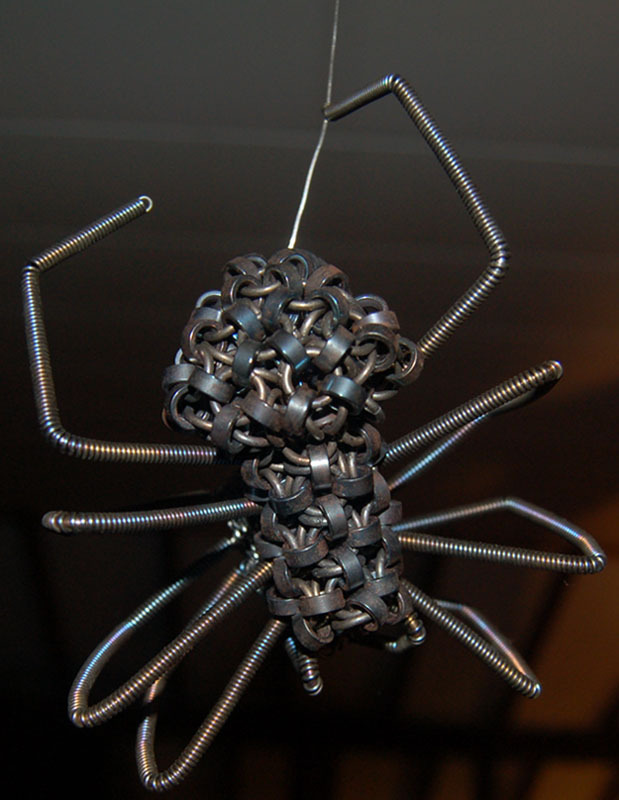 After making two maille spiders that pretty much just sit there and look all spidery, I had been wanting to make one that not only looks all spidery, but was also engaged in some kind of spidery activity. The main body parts are made out of a combination of Titanium and roller bearings (the black, squarish looking rings) from bicycle chains. The legs and mandibles are .035" stainless steel wire made into coils with an inner diameter of 1/16", they are supported on the inside by a 1/16" stainless wire that goes out to just past the first leg joint. The tasty looking thing this spider is munching on (or maybe it is an egg sack?) is made of stainless steel Euro 4-1 made up of 0.035" wire coiled to make rings of 1/8" inner diameter. The yummy little maille meatsack is filled with small cylindrical pieces of steel that come out of bicycle chains when I harvest them for maillable parts and so far the only good use I've found for them is as a filler material for things like this. The strand of web that the spider hangs from is several feet of 20 gauge sterling silver. The two maille parts of the body are done in the Jap-Cube weave, which was specially tailored to create create the rounded and spidery shapes. Total length, including body and legs, is about five inches.